I wanted to share with you something that I found on Amazon.com for 94 cents!!! 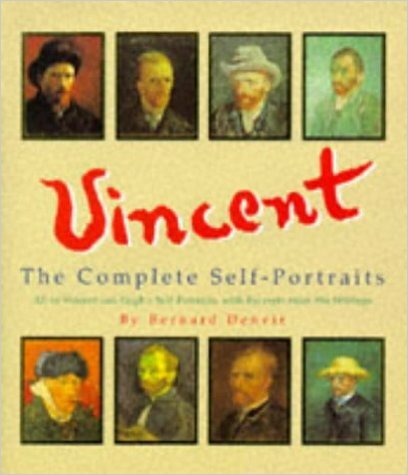 It is a hard cover book called “Vincent – The Complete Self-Portraits – All of Vincent van Gogh’s Self-Portraits, with Excerpts from His Writings” by Bernard Denvir. It was published in 1994. The writer points out that Vincent “painted more than forty self-portraits” in a span of only four years “between 1885 and 1889.” This really amazes me! That, to me, is a lot of work in the area of portraiture painting. I have done very few portraits and they have all been done from photos. Also, I have not attempted a self-portrait…yet. It is understandable that Vincent did so many self-portraits in such a short span of time. He was practicing because he expressed to his brother Theo in his letters that he wanted to try and learn how to paint portraits well so he could earn an income. He didn’t like being financially dependent on his brother Theo, but that is what happened for most of his adult life especially in his last years. He did his last self-portrait in 1889, then died in 1890. 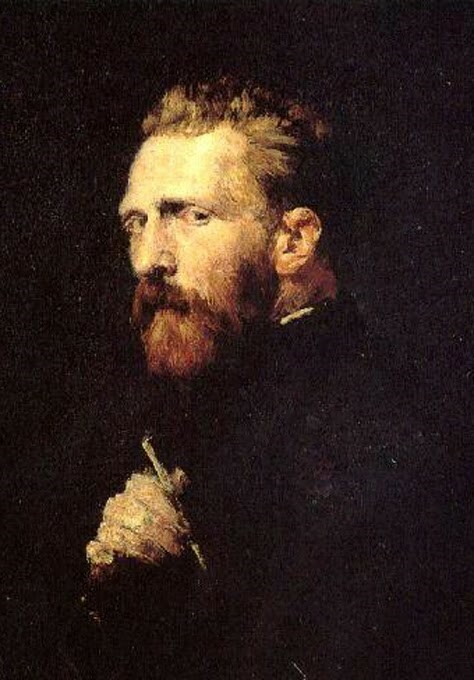 In my humble opinion I think Vincent van Gogh was much more handsome than he ever painted himself to look. Perhaps this was because of his mental illness and he painted himself the way he FELT about himself more so than the way he actually SAW his physical self. I don’t presume to know his thoughts. However, his letters do indicate that he did focus on his feelings a great deal in regards to his art. He felt things very deeply and had a sensitivity about him that really came out in the people he sketched as well as all of his other art. In the book I mentioned there is a painting of Vincent that was done by John Peter Russell in Paris in 1886. It is a striking portrait of Vincent which I think captures the depths of his soul in his eyes. Isn’t it beautiful? I hope you still enjoy these posts about Vincent van Gogh that I make occasionally. I feel like I can just never learn enough from this deep-thinker about life and art. P.S. I am still painting the Dungeons & Dragons miniatures, and have been getting back to experimenting with Sumi-E painting. I will show you what I’ve done in upcoming posts! Posted on February 2, 2017, in Art Talk and tagged color theory, Van Gogh, Vincent, Vincent van Gogh at 13 years old, Vincent van Gogh on Board, Vincent's Self-Reflections, Vincent's Thoughts on Colour. Bookmark the permalink. Leave a comment.